Want to pamper your cats while also getting creative in your kitchen for their benefit? If you said yes, then the best way to start is by going homemade on any special treats you offer your favorite feline friend. These Manuka honey catnip biscuits are always a great place to start, given they show your cats how special they are to you while also giving them something irresistible at the same time. The biscuits have the perk of being tasty and healthy for your cat when compared to some of the stuff you find in stores. 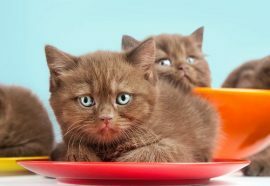 Just remember that these treats, while healthy, are still just treats, and they should not substitute your cat’s regular meals, as this could lead to your cat missing out on the vital nutrients they need to survive. Well, if you think you have found the right homemade cat treat recipe for you, then let us get started on these biscuits. Before you get started, preheat your oven to 350 degrees Fahrenheit. In the meantime, stir together the wheat four, the powdered milk, and the catnip in a large-enough bowl. Combine the egg, the milk, the Manuka honey, and the softened butter in a separate bowl using an electric mixer, a hand mixer, or by toughing it out by hand. Add the wet ingredients to the dry ingredients and mix thoroughly to create a fairly soft dough. If your dough feels too sticky, feel free to add some extra flour. Turn out your dough on a nonstick cookie sheet in order to roll it out. Then, cut your dough carefully into bite-size squares or other shapes, with the size of the treats varying by the size or even the age of your cat. Bake the biscuits for roughly 20 minutes until the treats develop a golden-brown color to them. Remove the cookie sheet from the oven and separate any treats that touched sides using a spatula. Allow the biscuits adequate time to cool down on a wire backing rack or on some wax paper. Store the biscuits in an airtight container for up to two weeks or freeze them for up to three months and thaw them as needed. Need to order some Manuka honey to make these treats for your cat? To get your order started, click here. And, remember, we offer free shipping on all orders of $150 or more.